The Spin: How a disparate set of individuals, NRIs, entrepreneurs, who-have-you, is changing the India narrative. By the end of 2010, even the rising GDP part was in trouble, with a series of financial scandals and internal squabbles plaguing Prime Minister Manmohan Singh’s government. Sanjaya Baru, who served as media advisor to Singh, says 2009 was Singh’s poll victory, but everyone in the Congress party pretended it was Congress vice president Rahul Gandhi’s. When Singh realised that the party was not with him, he let go of the India story. There was a void for someone else to fill. Led by Narendra Modi, scores of Indians like Vadlamani sought to do exactly that, giving the story what British economist and Labour Party peer Lord Meghnad Desai calls “the new-old spin”. What exactly is this new story—the spin if you will? Desai breaks it down to one simple but powerful idea: India was a rich country and could be rich again. The Congress with its socialist leanings wasn’t interested in pushing this idea, he claims, but that’s what people wanted to hear. To be sure, every political dispensation has brought its own spin to the India story—for instance, late Prime Minister P.V. Narasimha Rao (of the Congress) had, in the afterglow of liberalisation, proclaimed “India Means Business”—but sweeping discontent with the previous government and deft exploitation of mass-media platforms that simply did not exist in such potent form earlier turned Modi’s pitch into a tidal wave. It created, as Vadlamani says, “a palpable sense among Indians around the world that here’s a man speaking our language”. That’s the take-off point of the dominant narrative of 2014, by all accounts the most momentous year for India since the economy opened up two decades ago. In this version, armed with the spin, Modi proceeds to deliver a hysterical bump-up in “sentiment” (possibly the year’s most overused term) around all things Indian. Its most visible manifestation: the 42% spike in the Sensex between September 2013, when the Bharatiya Janata Party (BJP) announced him its prime ministerial nominee, and December 2014, roughly into his first six months in power. To put things in perspective, this was also the year when India reached (and tweeted from) the Mars orbit, the first country to do so at the first attempt, invoking awe worldwide. (Modi didn’t make it to Time’s Person of the Year shortlist, but Mangalyaan came second on its list of 2014’s greatest inventions, beating wireless electricity, nuclear fusion, and 3D printing.) Bellwethers of modern media—Quartz, BuzzFeed, and The Huffington Post—opened shop here, underlining the India story’s growing cachet. Facebook’s Mark Zuckerberg came bearing drone-beamed broadband, while Amazon’s Jeff Bezos visited with a $2 billion cheque, apparently to counter rambunctious desi e-commerce upstarts. And finally, manufacturing indicators hit a two-year high in December, even as, fatefully, China stuttered for the first time in a decade. Most commentaries on the year’s milestones, however, converged on one image: that of Modi, the teaseller-turned-PM, pulling the strings as sutradhaar (narrator), with ‘Swachh Bharat’, ‘Digital India’, and ‘Make in India’ his chosen epiphanies. It is a compelling image, except it glosses over the complex constellation of forces in a year when, as Twitter’s India and Southeast Asia market director Rishi Jaitly puts it, “something about India changed permanently”. Hindsight might yet prove that assessment disproportionate, but there is a feeling that in this India, spin—or, to put it differently, raucous exuberance after a period of sterility—is valid proxy for real change. The means, in other words, is the end. Modi is a prime catalyst in this, but to call him the only one does disservice to three much larger factors—each breaking away from the usual narrative of India and adding to the spin—even as they are strengthened by it. First, the emergence of a distinct right-of-centre idea of India, born out of disenchantment with the country’s self-image in the Congress years. Then, a dramatic power shift in the business community, with a new breed of first-generation entrepreneurs upstaging the elite establishment. And finally, the unfettering of public opinion brought about by social media, Twitter in particular. SHASHI SHEKHAR, CEO OF NITI DIGITAL, a digital information company, understands the power of ideas. Niti Central, the flagship of Niti Digital with the tagline ‘Bold and Right’, was funded by serial entrepreneur Rajesh Jain (himself a Modi votary) and became a key online resource for the Modi campaign, including its now famous Mission 272+ platform. An IIT-Bombay and Infosys alumnus (the typical profile of Modi’s backroom managers), Shekhar says he first began to think about a different idea of India when, in 1993, authorities at IIT-Bombay refused to let a cut-out of Swami Vivekananda appear in saffron clothes, which the monk wore for most of his adult life. “We finally had to show Vivekananda wearing blue clothes,” says Shekhar. Sanjay Anandram, serial investor, was looking to back a vehicle that would speak this language. In 2013, he chanced upon two techies, Prasanna Vishwanathan and Amar Govindarajan, who had been running a blog called Centre Right India, and had bought the rights to the Swarajya magazine for Rs 40,000. Swarajya was started by C.Rajagopalachari, who fell out with the first Prime Minister Jawaharlal Nehru and his Soviet Union-inspired economics. (Rajaji, as he was called, also started the Swatantra Party, promoting free-market economics, in 1959.) The revived edition has roped in veteran journalist Sandipan Deb, economists Bibek Debroy and Surjit Bhalla, and entrepreneur Jerry Rao on its editorial board. Vadlamani, for instance, is an investor in Swarajya and has funded the Creative India Foundation, which has several verticals on arts and culture, and patron of India Facts, a Right-leaning portal to promote research and opinion “countering the common socialist narrative of India”. He has also funded works by 25 Indian visual artists, and is the founder of the Advaita Academy, which promotes Vedanta. Vadlamani says he sees his work as he would any other start-up, asking what is the opportunity, what is the market. Each of these platforms has found its niche. India Facts publishes pugnacious rebuttals of Left-leaning opinion (‘Charlie Hebdo or the nuanced intolerance of our liberals’), while Swarajya is more sober (‘When will the NDA government reform the aviation sector?’). Niti Central, meanwhile, is everyday politics-focussed (‘Kiran Bedi joins BJP —will hurt Kejriwal’). All this, says Meghnad Desai, changes the way the world looks at India, at least temporarily. “It also changes the way India looks at itself,” he says. At least temporarily. FAR FROM POLITICS, another bunch of entrepreneurs is using the spin to wrest control of the India story from an exclusive set. In fact, if Modi permanently changed the course of India’s politics in 2014, there is a feeling that startups and entrepreneurs did the same to business. That’s the theme reverberating from the Financial Times (‘India’s startups are pulling in Silicon Valley’s big hitters’) to HuffPo (‘India On The Verge of a Tech ‘Gold Rush’’)—fuelled by Flipkart’s $11 billion valuation, JustDial’s Rs 950 crore IPO, SoftBank’s $837 million investments in Snapdeal and Ola, and Zomato’s overseas acquisition spree. Bangalore, India’s startup central and, some say, the challenger to Mumbai’s position as business capital, crackles with this feeling. Sitting in his office that also doubles as a godown for products under development, Rajiv Srivatsa, COO and co- founder of online furniture retailer Urban Ladder, sums it up: “Success breeds confidence, and confidence just spreads.” He says thanks to a blowout year for the Internet and mobile in general and e-commerce in particular (sales reportedly crossed Rs 1 trillion), entrepreneurs can now take bolder bets at a bigger scale. Srivatsa reacts sharply when we bring up the suspicion in some quarters that all this is one gigantic bubble. “This isn’t the dotcom era when people invested blindly without real demand,” he says. “We now have actual data that points in one direction: crazy growth.” He does, however, concede that there’s a sudden, unforeseen glamorisation of the entrepreneurial journey, denting the country’s obsession with “success”. Mukesh Bansal, who sold his fashion retail site Myntra to Flipkart in the most high-profile deal of last year, puts it more earthily. “Until now, people would look at the same guys and say, ‘taxi chalata hai (drives a taxi), kapde bechta hai (sells clothes), travel agent hai.’” Technology and exponential growth, says Bansal, have given these careers a new spin. It is hard to miss the echo of Modi’s chaiwallah persona, first used as a pejorative by the Congress, only to be spun by the BJP’s propaganda machine into a badge of honour. 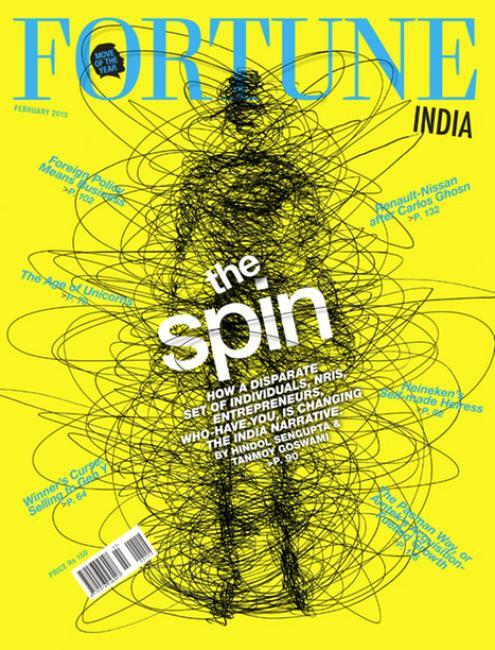 Startups like Team Indus that are in geekier businesses—it is best known for building a lunar lander for the Google LunarX Prize (see ‘India’s Unknown Moon Mission’ in Fortune India’s August 2014 issue)—don’t see the buzz as a post-2014 phenomenon. There’s always been a belief simmering in India’s entrepreneurial ecosystem, argues Rahul Narayan, the team’s founder, which has nothing to do with the highs and lows of the Sensex. He bats for the need to preserve a sense of continuity. “We, for example, were inspired by what the Indian Space Research Organisation (ISRO) had already achieved.” Bansal too points out that while market sentiment ebbed in the past few years, consumer sentiment, especially in e-commerce, has been consistently on the rise. There’s also consensus that the roots of the startup boom lie in the IT revolution long before Modi. (More than one entrepreneur says startups mushroomed in Bangalore because software engineers working in the city’s big IT companies were disgruntled with their day jobs.) That said, most are happy to play along with any kind of spin that keeps the current euphoria going. Srivatsa admits that the media has made the startup story look bigger than it is, so that old-fashioned corporate results no longer monopolise the news. The media’s love of course has its own loaded context. “There’s a lot of you-scratch-my-back-I-scratch-yours that goes in reporting on big companies,” says Anant Goenka, the 29-year-old director of new media at The Indian Express Group. “I’m not suggesting paid news, but ‘If you cover my launch on page 1, I’ll give you an exclusive with my CEO’-type conversations are increasingly rampant in the business news space.” Goenka says writing about startups is an easy route to humanise and be less dependent on corporate India’s mighty public relations companies. HUSTLE IS ONE OF THE words Twitter’s Rishi Jaitly invokes to describe his impression of India in 2014. “I remember sitting on a conference call in 2012 (the year he took the job) and telling my colleagues, ‘2014 will be big’.” With 56 million election-related tweets in the five months to the polls, that prophecy came alive. Khursheed suggests that one of the reasons the Congress was swept away in the elections was that it failed to use that formula (read: juice the social web as effectively as Modi). He insists that rather than centralising power, Twitter’s two- way microphone allows everyone ownership over what ought to be the agenda in public conversations. That also means while you can craft a clever message, you cannot predict or control what spin it will end up acquiring. A big part of Khursheed’s job is to help users like Modi deal with the constant public demand for new content. This is the meme culture, where the importance of a message is decided by how quickly it spirals into a #trend, and how long it stays there. Modi can learn a thing or two from Obama about shouldering this burden. “He’s done Reddit AMAs; he’s appeared on web comedies; he’s smiled for a slew of behind-the- scenes photos and GIFs, all tastefully filtered and posted to Instagram. The Obama White House is on literally every mainstream social network except Myspace; there are people employed at said White House who are paid to turn Obama’s policies into ‘shareable’ memes”, the Washington Post wrote days before the President’s India visit. Khursheed shares a story. On Modi’s birthday, as he acknowledged the wishes of the hoi polloi on Twitter, one follower went unnoticed. “Why are you ignoring me? Have you blocked me?” he demanded of the PM. In another India this guy wouldn’t stand a chance, says Khursheed. But Modi, whose image as a grassroots Prime Minister is at stake, placated him with a smiley face. Modi of course knows the perils of overdoing a spiel courtesy BJP’s disastrous ‘India Shining’ campaign in 2004, which Chintamani Rao, a strategic marketing expert and former CEO of Times Global Broadcasting, describes as a hollow manufacturer’s claim. In contrast, ‘Make in India’ is a proposition. It provokes the question, “Why?” If that is answered effectively, it will work. If not, it will be another vacuous slogan, Rao says. At this year’s Vibrant Gujarat, a business summit started by Modi himself in 2003 and played up these days as the Davos of the East, CEOs seem cautious. Piyush Gupta, CEO of Singapore-based DBS Bank, says all that the spin has done is to change “the real disillusionment about India under the last government. Everyone woke up to the fact that the Indian reality had little to do with the India story,” he says, adding that the new government won’t have forever to start executing. “Ordinances to push reform show resolve, but that’s just the beginning,” Gupta says. Where things go from here will determine whether DBS goes ahead with its plan of opening 80 branches in India in the next five years from its current six. Richard Lancaster, CEO of China Light and Power, says even though his company is committing $2 billion to build new coal-based power plants in Gujarat, it is in wait and watch mode. Walmart India CEO Krish Iyer is hoping to have 70 stores by 2020. That means a lot of investment (he will not say how much). “Investment needs momentum and goodwill,” says Iyer. “The climate needs to support it.” Has the climate changed? “The move towards administrative reforms is useful; we are hopeful,” is all he says. Don’t such middle-of-the-road statements signal a comedown from the frenzy a few months back? Diane Farrell, acting president of the powerful U.S.-India Business Council, in India as part of Obama’s visit, argues that’s an unfair way of looking at things. “This government is clear that it will not make flashy, big-bang decisions that grab the headlines. It is going about its work quietly,” she says. Meanwhile, Farrell would have you believe there’s little fear of Modi getting carried away by his own spin. “He doesn’t allow himself distractions,” she says. India’s multibillion-dollar vernacular press is flirting with the new digital world. Can it cut out the distractions and take the next step online? VINAYAK PARAB remembers the angry letters from readers in the mid-1990s, when his employer, the Marathi daily Loksatta launched in 1948 by the Indian Express Group, started writing about computers. “No other Marathi paper would touch the subject,” Parab, one of Maharashtra’s best-known technology writers, who’s now executive editor of the Marathi magazine Lokprabha published by the same group, tells me on phone from Mumbai. “They were scared that it would repel the aam aadmi who was their core market.” But Parab hunkered down and took out a 90-part series demystifying cathode ray tubes and suchlike. After the initial resistance, he says, circulation shot up on days the column was published. It’s a well-worn parable on legacy publishers in the digital age, which has three well-known subplots. To wit: Venerable mastheads—think the New York Times—embracing digital but stumbling at monetisation; the rise of digital-only—Huffington Post or Quartz; and finally; social upstarts—Buzzfeed, Twitter, or Facebook—upending all things media. Even in India, one of the world’s last few growing print markets, this story has played out ad nauseam. Except, as with the examples above, it has been shaped almost exclusively by the English media, neglecting Parab and his ilk. Jayanta Ghosal, editor (Delhi) at the largest-circulated Bengali daily Anandabazar Patrika (owned by the ABP Group, which also publishes Fortune India), sees in it the English media’s arrogance. “It has assumed the “national” title, although its footprint is a fraction of the regional languages.” He finds support in Sanjay Pugalia, who worked with the Hindi daily Nav Bharat Times (owned by Bennett, Coleman and Company) among others, before taking over as editor of the Hindi business channel CNBC Awaaz (Network18). But, Pugalia adds, “many regional players were themselves lethargic and did not engage with digital holistically.” While some were convinced that it wasn’t relevant for them, others clung on to the familiar logic that pushing digital would cannibalise print. Those who did act seldom went beyond building websites. Generalisations about India’s gigantic vernacular press (see graphic) can be risky. But the nuance in Pugalia’s rebuke—the lack of a holistic approach—is valid. Consider that the editors of the biggest vernacular newspapers are virtually nonexistent on social media. Contrast that with their peers from the English-language press who produce a glut of analyses on digital platforms, evangelising their papers’ brands on, say Twitter, almost as a matter of hygiene. Pugalia puts the difference down to the feeling in the regional press that such spaces are “elitist fads”. For long, that stand was justified by the absence of an Indian-language setup on the web. But advancing technology, and vernacular readers developing digital habits, are blowing holes in that argument. Vernacular media is on the cusp of disruption and gainsaying that is perilous. Then there’s the buzz around vernacular-enabled mobile devices—led by Google’s Android One, which supports seven Indian languages and was launched at a globally watched event in Delhi last month. Google India head Rajan Anandan predicts that the next 300 million Internet users in India will access it in the vernaculars—the lion’s share of them on mobile. Google Trends shows that searches using the keywords ‘news in Hindi’ have jumped 350% in the past five years, with even bigger returns for Bengali, Marathi, or Malayalam. The report backs this up with compelling numbers: Between 2012 and 2017, the market for vernaculars including Hindi—which already account for 62% of the print industry’s revenues and cater to 89% of its readership—will likely expand at a compound annual rate of almost 11%, from nearly Rs 14,000 crore to Rs 23,000 crore. The growth in English: less than 5%. Little wonder that heavyweights Bennett, Coleman and Company, and Kasturi & Sons (which publishes The Hindu) have launched papers in Bengali and Tamil, respectively, in the past few years. Dainik Bhaskar Group—a listed company with a market cap of over Rs 6,000 crore—which publishes 58 editions of the eponymous Hindi daily across 13 states (highest circulation in Hindi as per the Audit Bureau of Circulation)—along with papers in Marathi and Gujarati, is among the top non-English players with a digital thrust. Its website ranks among India’s top 100, according to analytics portal Alexa. But over the course of my interactions with them, they stress that talk of digital must not undermine the regional print story, which will remain extremely strong for the next 10 to 15 years. THE CHANGE in mindset starts with unravelling vernacular’s “core market”. The Internet and Mobile Association of India (IMAI) and market research firm IMRB International say 60% of urban Internet users access content in Hindi (followed by Tamil and Marathi). In rural India, on the other hand, Hindi’s share is 27% (followed by Marathi and Tamil). Over 70% of Newshunt’s users come from urban areas. Even with Dainik Bhaskar’s 50 lakh circulation, more than half comes from big cities. B.G. Mahesh, founder of vernacular news portal OneIndia, confirms that it’s “wrong to assume only [smaller centres] consume Indian languages”. OneIndia creates original content in seven Indian languages (as well as English) and gets 25 million unique views a month. “We have seen impressive growth even in tier 1 cities,” claims Mahesh. OneIndia has reported profits for 16 straight months, and has revenues of Rs 20 crore. BG Mahesh, founder, OneIndia, says it’s wrong to assume only the small-town Indian consumes Indian languages. Top Hindi publishers are on the trail. Dainik Bhaskar Group’s digital business grew 54% year on year to Rs 16 crore as of fiscal ending March 2014. (That compares with Rs 76 crore for HT Media, which owns the English dailies Hindustan Times and Mint, and the Hindi daily Hindustan, plus miscellaneous job search, education, and entertainment portals.) Jagran Prakashan—the parent company of Bhaskar’s rival Dainik Jagran (whose portal is also among Alexa’s top 100)—also reported “steep growth” of 150% in digital advertising revenues, “albeit on a smaller base”. Apart from the main news portal, Jagran runs a clutch of education and classifieds portals, and in July launched a site where advertisers can compose, book, and pay for print classifieds. But advertisers are cold. Goenka says there’s some support from Marathi clients who patronise the newspaper, but digital is so far down their list that even with the biggest of them, Loksatta’s own team has had to help convert creatives to suit digital formats. “Revenue in regional languages is all about investing in creating a marketplace, which is far too nascent right now,” says Goenka. “We have been distracted with print. Maybe we’re better off waiting for Google to invest in getting that local sari shop in Thane to create a digital ad.” He adds that Google has advertised in Loksatta print—in Marathi copy— asking small and medium business owners to put up websites. Anant Goenka, head – new media, The Indian Express Group, says the regional digital marketplace is far too nascent. Advertisers like Dabur, which have equal emphasis on metro and non-metro markets, indicate a chicken-or-egg problem. The vernacular industry hasn’t proven return on investment in digital yet,” says K.K. Chutani, executive director-marketing, Dabur India. He contrasts that with the success of Indian-language entertainment channels, which are a key part of every national advertiser’s budget. Brands like Uninor, known for their regional focus, are also waiting for things to mature. Till then, presence on vernacular digital platforms “is a good-to-have, not a must-have”, says Rajeev Sethi, Uninor’s chief marketing officer. MUCH BIGGER upheavals are under way on the social side. Think of the blokes buying Marathi guides to spruce up their Facebook profiles. “This is the newly learned class,” says Pandey of India Today (Hindi). “Earlier, the newspaper at home was the ultimate statement of moving up in life for them. Now, that role is played by Facebook on the latest smartphone.” That changes everything—starting with their lifestyle aspirations, and ultimately, their perception as consumers. Recognising this, e-commerce player Snapdeal recently announced services in Hindi and Tamil. Dainik Jagran and Dainik Bhaskar again have a headstart here, with approximately 46 lakh and 40 lakh likes for their Facebook pages, respectively. Apart from the page for the main brand, Jagran has pages for its Meerut and Muzaffarpur editions. Leaders in other languages include Kozhikode-based Malayalam daily Mathrubhumi (13 lakh likes), Loksatta (5 lakh), and Anandabazar Patrika (3 lakh). Kalpesh Yagnik, group editor at Dainik Bhaskar also talks of newsrooms integrating social tools: “When the Indian Oil plant at Hazira caught fire, our print reporters reported real time for our websites, and the updates were put up on our app and on social media.” More significantly, he says social media has itself become an important genre of news in print. “During the Lok Sabha elections, we dedicated a full page to social-media content for a whole month. We also covered the Instagram buyout in the front page.” Though the coverage may not be as in-depth as in English, Yagnik says stories on social media companies are becoming popular because people like Zuckerberg “don’t look like tycoons” and inspire young people. However, the picture is different on Twitter—the first port of call for both creators and consumers of content, especially news. Here, individual editors constantly interacting with readers are often more impactful than institutional handles spewing links. But vernacular editors/writers tweeting in their own language, even using English script, are hard to find—barring a handful like Loksatta’s Girish Kuber (over 5,000 followers), or Jagran’s Bollywood writer Ajay Brahmatmaj (over 10,000 followers). It’s difficult to say whether this is because of official policies or poor motivation. A standard argument has been Twitter’s lack of vernacular input. But for the past three years, the site has been available in Hindi. More recently, it added Bengali, and says it’s looking at other languages. Yagnik claims “readers don’t go to social media for news, but for jokes or other personal content”. But Raheel Khursheed, Twitter’s head of news for India, says the media would do well to remember the case of the yellow pages, which thought users wouldn’t go anywhere else to search—until one day, they got hooked to JustDial. THERE’S BROAD AGREEMENT that the vernacular digital play revolves around very different issues (literacy, class) from those in English (survival of print, monetisation)—but the industry is yet to free itself from comparisons with English. “The emphasis is on ‘we are not like English,’ rather than ‘this is what we want to be,’” says a former ad executive who worked on the revamp project of a leading Hindi daily.